Freelance writer and reviewer Bill Bodden has taken a classic Halloween entity and given a new twisted presence in our Halloween Horror series. Artist Jeff Preston helped bring this creature to life with some of his darkest art. Scarecrows are a staple image of Halloween, but when was the last time you found a scarecrow even slightly scary? Scarecrows are merely discarded clothing stuffed with straw and stuck on a pole to simulate a human presence in farm fields to keep larger pests, like deer and crows, away from food crops. Ancient ritual demands that the scarecrows be ceremonially burned just after the harvest — around the time of Samhain, or Halloween – and added to celebratory bonfires as an offering to traditions we no longer remember. If the scarecrows aren’t burned, wandering spirits might decide to move into one, animating it and causing all sorts of mischief. Some spirits just like to play pranks, while others have a less well-developed sense of humor…. A possessed scarecrow spends its days hiding from the sun in a clump of trees or an abandoned building or shed. If discovered, it will ‘play dead’ unless threatened. Sometimes it will remain on its post in the field as if nothing had happened. At night, it moves freely about the countryside making mischief: knocking on doors and windows, breaking fences so cattle can escape, and causing milk to spoil even while still in the cow. Beer, wine and cider will also spoil at the passing of these creatures, and any crops still in the field will rot and turn rancid. In rare instances, their presence can cause any sort of baby animal still in the womb — even human children — to be stillborn. More aggressive scarecrows seek to possess something with more substance, and will attack a lone human in an attempt to drive out that person’s spirit out of its body. The scarecrow spirit will then move in, live among humans and causing as much pain and suffering as it can get away with before being discovered. Once discovered, the spirit will flee the body at the first opportunity and start the cycle all over again. Because of its desire for a more substantial body, a scarecrow is unlikely to use weapons in its attack. Some scarecrows are the spirits of people who died feeling they were wronged by their neighbors; these kinds of scarecrows will kill indiscriminately. In their new state of awareness, they are unable to distinguish between former friends and foes. Because of the nature of that form it occupies – dried hay, clothing and sticks or old animal bones — fire is a scarecrow’s mortal enemy. 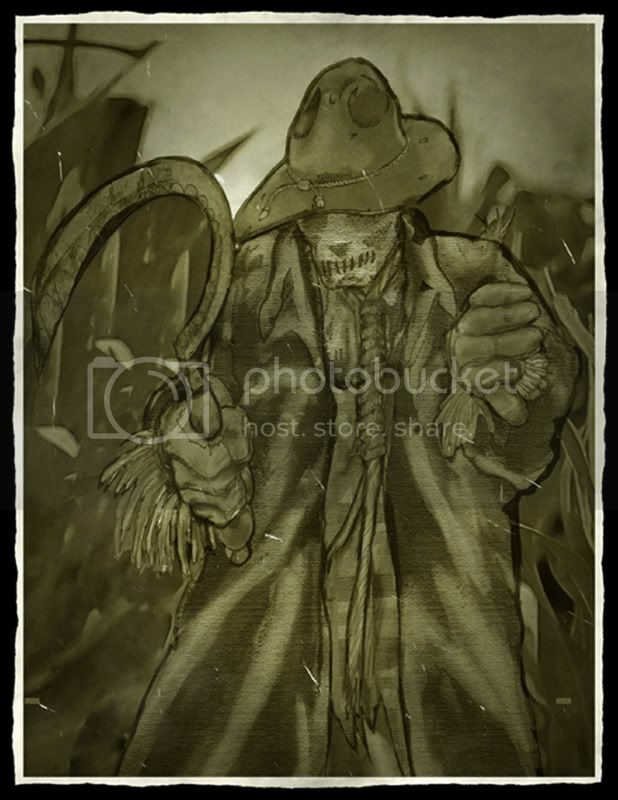 If a scarecrow is burned with the spirit still inhabiting the scarecrow form, the spirit has a very good chance of being destroyed or banished from this world forever. If it escapes this fate, it will be understandably upset, and try to take revenge by causing fires to homes and barns. This is why it’s better to make sure all your scarecrows are burned before the Halloween or harvest festivities come to an end. Bill Bodden has been a freelance writer in the games industry for more than seven years. He regularly writes reviews for Scrye and Amrchairgeneral.com, and had an essay on finding out-of-print games included in the book Hobby Games: The 100 Best. Bill was nominated for an Origins Award in 2003 for short fiction published in Games Unplugged Magazine in 2002. Bill also works part-time for Green Ronin Publishing handling wholesale sales and marketing.